A car uses quite a lot of electricity to work the ignition and other electrical equipment. Inside an alternator the belt-driven rotor becomes an electromagnet when current is fed to it. As the rotor revolves it generates a higher current in the stator windings. If the power came from an ordinary battery, it would soon run down. So a car has a rechargeable battery and a charging system to keep it topped up. The battery has pairs of lead plates immersed in a mixture of sulphuric acid and distilled water. Half of the plates are connected to each terminal. Electricity supplied to the battery causes a chemical reaction that deposits extra lead on one set of plates. When the battery supplies electricity, exactly the opposite happens: the extra lead dissolves off the plates in a reaction that produces an electric current. The battery is charged by an alternator on modern cars, or by a dynamo on earlier ones. Both are types of generator, and are driven by a belt from the engine. 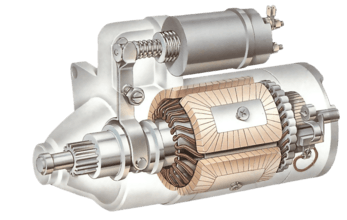 The alternator consists of a stator - a stationary set of wire coil windings, inside which a rotor revolves. The rotor is an electromagnet supplied with a small amount of electricity through carbon or copper-carbon brushes (contacts) touching two revolving metal slip rings on its shaft. The rotation of the electromagnet inside the stator coils generates much more electricity inside these coils. The electricity is alternating current - its direction of flow changes back and forth every time the rotor turns. It has to be rectified - turned into a one-way flow, or direct current. A dynamo gives direct current but is less efficient, particularly at low engine speeds, and weighs more than an alternator. A warning light on the dashboard glows when the battery is not being adequately charged, - for example, when the engine stops. There may also be an ammeter to show how much electricity is being generated, or a battery-condition indicator showing the battery's state of charge. Moving a magnet past a closed loop of wire makes an electric current flow in the wire. Imagine a loop of wire with a magnet inside it. The north pole of the magnet passes the top of the loop as the south pole passes the bottom of it. Both passes make current flow in one direction round the loop. The poles move away, and current stops flowing until the south pole reaches the top and the north pole the bottom. This makes current flow again, but in the opposite direction. A car alternator uses an electromagnet in order to boost output of electric current. Field windings inside the body are a dynamo's electromagnet. Current is generated in the revolving armature. In a dynamo the electromagnets are stationary, and are called the field coils. The current is produced in an armature - another set of coils wound on to a shaft and turning inside the field coils. 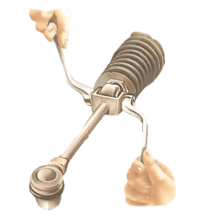 The principle is the same as that of the alternator, but the current goes to a commutator - a metal ring split into segments that are touched by carbon brushes fitted in spring-loaded guides. Two segments touch a pair of brushes and feed current to them. As the armature turns, the current changes direction. But by then another pair of commutator segments has come under the brushes, and this pair is wired up the other way round - so the current coming out always flows in the same direction. The current from an alternator is rectified into direct current by a set of diodes that allow current to flow through them in one direction only. To charge the battery the voltage supplied to it must not be too low or too high. The alternator has a transistor-operated control device that regulates the voltage by supplying more or less current - as required - to the electromagnet. 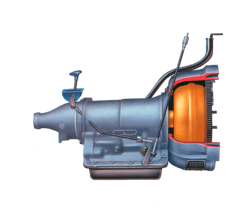 The rectifier and regulator are usually inside the alternator housing, but on some alternators they are outside, mounted on the alternator body. A dynamo does not need a rectifier -there is a voltage regulator in a separate box, which has relays. One relay controls the voltage level by briefly cutting off the current in the field coils. The second relay prevents the dynamo from overcharging and damaging the battery. The third relay stops the battery discharging when the dynamo is turning too slowly to charge it.